In September 2012, Mayor Rahm Emanuel thrust Chicago onto the technology bandwagon by announcing his intentions to turn Chicago into “one of the digital capitals of the country.” His first step: launching the Chicago Broadband Challenge to get everyone connected to gigabit-speed internet. That same year, Governor Pat Quinn announced plans to bring high-speed internet statewide. Quinn awarded Gigabit Squared, a broadband development company, $2 million to develop high quality, affordable broadband service in the Hyde Park, Kenwood, Woodlawn and Washington Park neighborhoods by the end of 2013. Today? Nothing. No ultra-high-speed connections have been established for either the Mayor’s or the Governor’s plans. The Chicago Broadband Challenge has only just entered its second phase, reviewing qualifications of potential companies. And the University of Chicago has dissolved its portion of the contract with Gigabit Squared, which has left a trail of uncompleted broadband projects in other cities. Frustrated by the pace, Pierre Clark has taken matters into his own hands. A technology consultant, Clark is the executive director of the Woodlawn Broadband Expansion Partnership and the Southside Broadband Expansion Collaborative. He partners with local businesses and organizations, including the University of Chicago, to explore implementing widespread gigabit-speed broadband at lower cost than what is currently provided. During the next month, Clark will be installing broadband service for two blocks in Woodlawn as a test-run, and plans for all of Woodlawn to have quality internet connection by the end of the year. 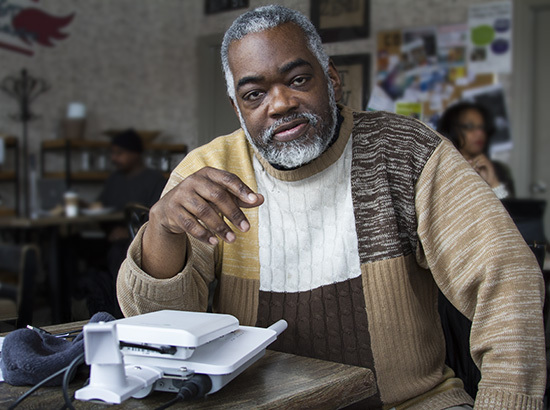 The Chicago Reporter spoke with Clark to find out more about his plans, and why he thinks high-speed internet is so important for Chicago’s low income communities. How did you get involved in Chicago’s race for high-speed, easy access broadband? Karen Mossberger, a technology researcher [from the University of Illinois at Chicago], found that 40 percent of our community isn’t connected to the internet, and if they are connected it’s from the Stone Age. If you look at her breakdown of where those people live, they’re in the low-income areas. That’s why I do what I do. One day in 2010, I sat in a Woodlawn coffee shop and was talking with a colleague who is also interested in technology innovation. We discussed what Woodlawn really needed to get up on its feet economically. We realized a big part of that is technology innovation — and high-speed broadband is the best place to start, because it’s something everyone can potentially access, and it’s easy to use. Then in 2011, I had a meeting with representatives of the city and state, the University of Chicago, and some local Woodlawn businesses, to talk about broadband expansion and how we can make it happen. After that is when the Mayor and the Governor started rolling out their plans to the public. Where is Chicago right now in terms of broadband expansion, and who is involved? There are a lot of players at the moment, because a lot of people see how valuable this can be. The University of Chicago, which I partner with on some projects and research, is a part of Gig.U, a group of research institutions who want to make this happen. The city and state are still working on their own plans, although with slow results so far. That’s why my partners and I continue to do what we do on our own, starting with our broadband test site in Woodlawn. Why did you choose Woodlawn as the geographical center of your plans? Being close to the university is smart because they share our end goal, so sharing resources and information with each other helps everybody win. Besides that, Woodlawn has always been in the forefront of community organizing, starting with Saul Alinsky, who really founded the community organizing movement here in Woodlawn. So this was a natural starting point. Locals are interested in what goes on in their community and we need their support to show that what we are doing is valuable. Your plan is to bring gigabit-speed internet to Chicago. What is the value of having internet that fast? On a basic level, gigabit-speed connection means no buffering for videos and audio, and no delayed download speeds ever again. This is a speed which should be made available to everyone. If you get your internet from Comcast your top speed is going to be 50 megabits per second. It depends on how much of what we call “cable bandwidth” is installed in the area and how many people in one area are accessing that internet at the same time. So densely populated areas or areas with a bad bandwidth won’t have great internet service. If you experience 10 megabit speed, then you experience gigabit speed, you won’t ever go back to the slower speed again out of choice. If you want to run a business where you need to download large amounts of files or work with a lot of data, you can’t function on that slow speed. So this affects people in Chicago communities who want to start businesses, but can’t pay the thousands of dollars it costs to get gigabit-speed internet. It was reported that you were unimpressed with how Gigabit Squared, the company contracted to expand high-speed internet throughout Chicago, was doing its job. Can you tell me about that? When Pat Quinn began searching for solutions to implement widespread broadband, I actually recommended Gigabit Squared to him, because they seemed to be on top of their game and were working with other cities to do the same thing. In 2010 they were given $2 million to bring high-speed, low-cost broadband to Chicago. Has that happened? The answer is obvious. How can that much money be given for a specific cause and not a single step towards results have happened? That’s my simple answer to why I am not impressed. How does technology tie in with the economic development of Woodlawn and other underserved areas of Chicago? How do you apply to a job today? You don’t look in the local paper, you do it online. How do you write a resume? You type it on a computer. You contact health services, social services, everything online. Obviously there are a lot of people who don’t have computers in their homes, but they do have smartphones. It’s possible to run a lot of your life off of a smartphone — I know I do. Again, you just need an internet connection and to be taught how to do it. Once you have set up high-speed internet in your areas of choice, how will you ensure people will actually use it? Communities have to determine their own destiny, and each community will have to determine how it will utilize this technology. But once there are options and capabilities made available to people, what is the value in not using them? In my experience, people are very curious about the internet and what it can do for them. The biggest problem people from low-income areas face is education in technology, so one of the things I do is make sure that people get education in how to use the internet in the best way possible for them. This might involve showing them how to search and apply for jobs online, how to find services online like doctors or electricians, things that help you live in the 21st century. How will you know when you have succeeded? A successful implementation of broadband is when everyone in an area is connected to the online world and using services online on a regular basis. When it’s a regular part of everyone’s daily life, and quality service isn’t reserved for people who can pay thousands of dollars for it. is an intern at The Chicago Reporter. Organizers aim to avert gentrification brought on by the Obama library through an ordinance that would require the city and the University of Chicago to protect and support nearby residents. In the months before the off-campus shooting of student Charles Thomas, University of Chicago police sharply stepped-up proactive stops, overwhelmingly targeting people of color, our analysis shows. From poverty to household earnings to Internet access, economic conditions for black and Hispanic residents lag behind those of whites according to newly published figures.